For more information and further details surrounding the material discussed in this video and to earn additional CME credit, click here. The intended audience for these activities are endocrinologists and other healthcare professionals involved in the treatment of patients with type 2 diabetes. Assess the pathophysiology of hyperglycemia, its role in macro and microvascular diseases, and the role of incretin pathways in type 2 diabetes mellitus. Examine the differences in mechanism of action, efficacy, and safety of treatment options that target the incretin pathway. Incorporate evidence-based guidelines and recommendations into practice when considering the use of incretin-based therapies for type 2 diabetes. Examine approaches to managing the obese patient with type 2 diabetes. Utilize GLP-1 agonists and DPP-IV inhibitors in combination with insulin and oral agents to achieve optimal glycemic control. 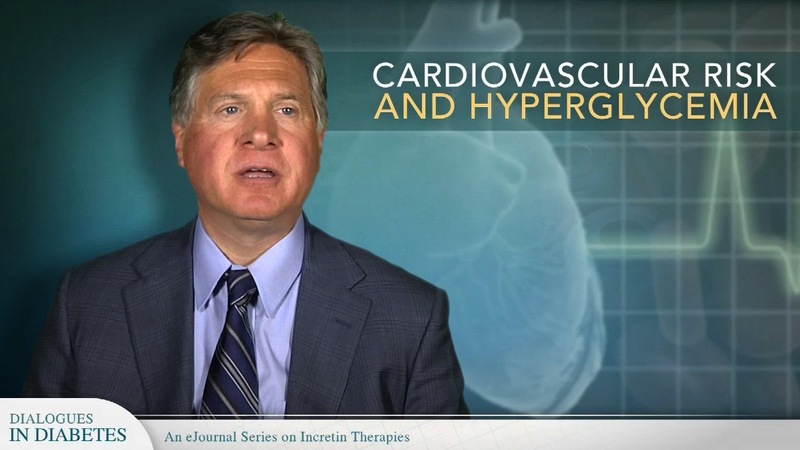 Analyze the potential cardiovascular benefits of incretin therapies in addition to glycemic control. This eJournal series consists of expert commentary and key highlights from the Editorial Board of the CME publication series Dialogues in Diabetes, mailed in conjunction with Endocrine Today, in September, October, November and December 2013. This enduring material is approved for 1 year from the date of original release: December 9, 2013 to December 8, 2014. To participate in these CME activities, you must read the objectives, answer the pretest questions, watch the presentations, complete the CME posttests, and complete the evaluations. Provide only one (1) correct answer for each question. A satisfactory score is defined as answering 2 out of 3 of each of videos posttest questions correctly. Upon receipt of the completed materials, if a satisfactory score on the posttest is achieved, Vindico Medical Education will issue an AMA PRA Category 1 Credit(s)™ certificate. Speaker’s Bureau: Amylin Pharmaceuticals, Inc., Bristol-Myers Squibb/AstraZeneca, Janssen Pharmaceuticals, Inc., Johnson & Johnson Diabetes Institute, L.L.C., Merck & Co. Inc., Novo Nordisk, Sanofi-Aventis, Santarus, Vivus, Inc. Consulting Fees: AbbVie, Amgen, AstraZeneca, Daiichi-Sankyo, Esperion, Lipidemx, Merck & Co., Inc. Speakers Bureau: Merck & Co., Inc. Ownership Interest: Prior to July 2013, ownership interest in Omthera Pharmaceuticals, Inc. Created and published by Vindico Medical Education, 6900 Grove Road, Building 100, Thorofare, NJ 08086-9447. Telephone: 856-994-9400; Fax: 856-384-6680. Printed in the USA. Copyright © 2013. Vindico Medical Education. All rights reserved. No part of this publication may be reproduced without written permission from the publisher. The material presented at or in any of Vindico Medical Education continuing medical education activities does not necessarily reflect the views and opinions of Vindico Medical Education. Neither Vindico Medical Education nor the faculty endorse or recommend any techniques, commercial products, or manufacturers. The faculty/authors may discuss the use of materials and/or products that have not yet been approved by the US Food and Drug Administration. All readers and continuing education participants should verify all information before treating patients or utilizing any product.